Today was the big day for my gf baby shower. I was rather grumbling a bit that it was at 10:30am on a Sunday, but with today’s blizzard (which is still going on 12 hours later) I’m glad it was early It was a truly wonderful shower – no games thank God!! Just breakfast buffet, a cafe bar (OMG it was awesome) and wonderful times with great friends. Even with the snow coming in like it was, there was an awesome turnout! I was so busy helping with the gifts I didn’t notice she had reached mine LOL. 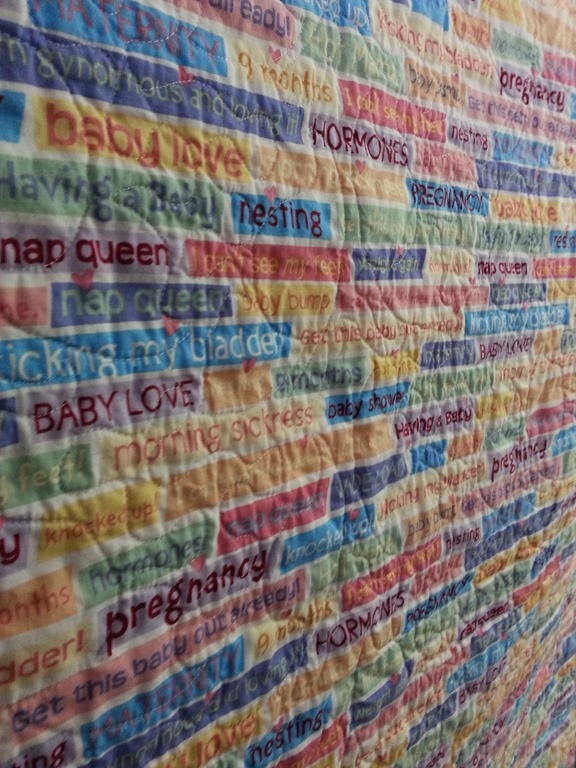 Honestly, I teared up when she was looking at it and reading the label – I could hear the emotion in her voice – it’s so nice to know that she loves the quilt. After the shower my plan was to work on a mystery but I was just to tired – I ended up napping for about 4 hours. 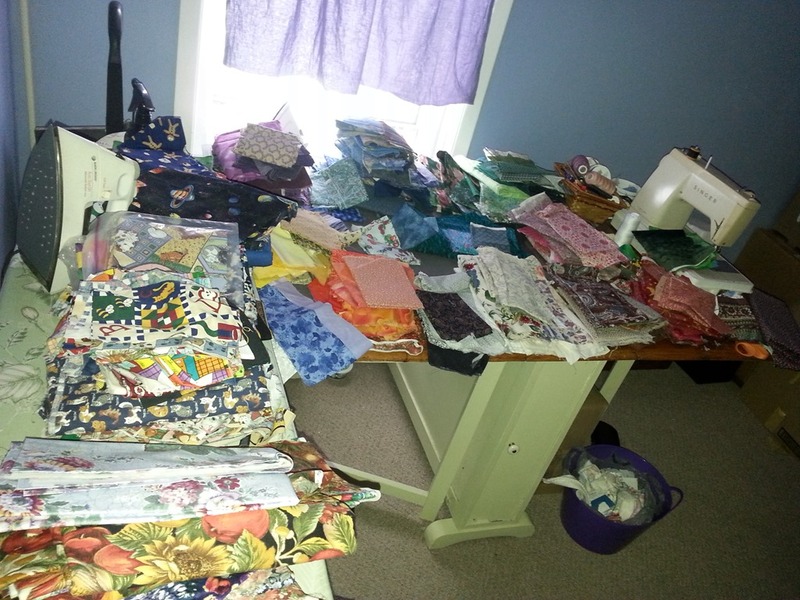 Last night I did pull out most of my fabric to sort of take stock on what I have. Of course I do not think that I have enough – what woman thinks that .. every LOL. I do know I need more whites, creams etc But I do have several pieces that are large enough for backgrounds of quilts and a few I would call ugly that are perfect for backings for wall hangings LOL. This isn’t al of it – but enough for me to get an idea of what I’ve got and need more of. I’ve some good selections for watercolour quilts – just have to cut it up – what I would really love to find is my ruby beholder – that would make it so much easier to find the proper values of my fabrics. 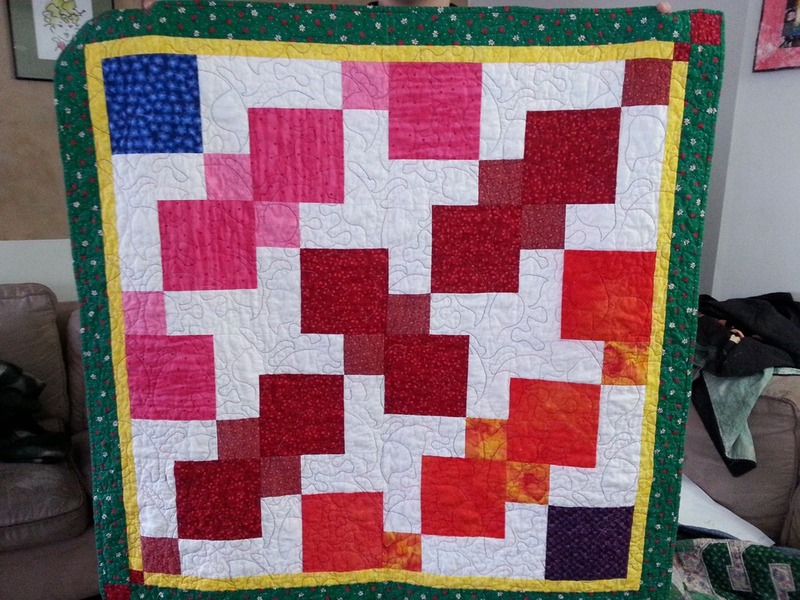 I did find that using my cell phone camera works fairly well to do the same that’s how i found out that the light red I picked for Ruby’s quilts wasn’t a good selection as it was more a dark pink. Glad I saw that BEFORE I cut the fabric pieces. « And .. it’s done! It turned out beautifully!! I’m so glad she loved it!